MRI is a tomographic diagnosis of the body without using radiation. It is considered one of the safest types of surveys. However, there are some limitations to its application. 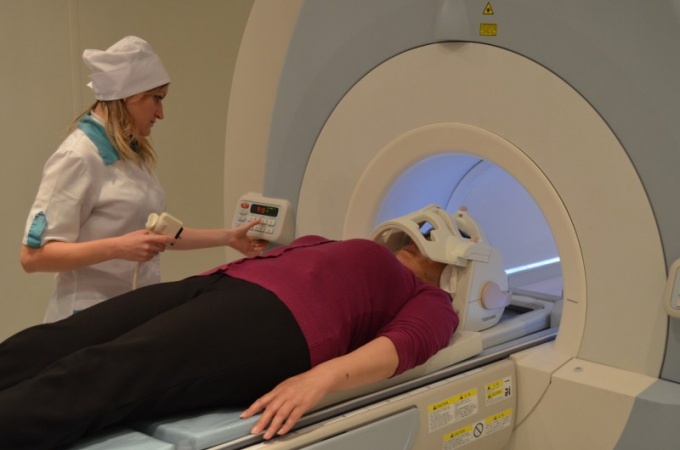 Magnetic resonance imaging is performed through special device inside which creates a constant powerful magnetic field. With the help of the forming elementary particles (hydrogen atoms) in the body diagnosed. The device emits radio waves whose frequency coincides with the frequency of oscillation of the particles as the result wave they "scan". Data obtained by the computer translates into an image. Indications for head MRI are constant headaches and dizziness, loss of consciousness, fainting, numbness of the face or a sharp pain in it, blurred vision and hearing. In some cases, it may be shown on a regular scan: the presence of hypertension, intense physical training, classes vysokoaromatichnyj sports (martial arts, Boxing, etc.). There are a number of absolute contraindications to MRI: pregnancy, claustrophobia (but there are open machines), presence in body of metallic implants not only because of the threat of displacement and trauma, but also because of the possibility of image distortion. The presence in the body of an artificial pacemaker heart (pacemaker) or auditory implant is also a contraindication, since MRI will disrupt their work. The replacement method of the study of the body can be a tattoo made with dye-based metal compounds. With regard to metallic dental implants, when available, MRI is not carried out. Another question – is it possible to use MRI, if the patient has non-removable metal crowns. Previously, crowns were used steel, steel plated with copper. MRI will not have an impact on, but these metals can cause image distortion. Modern crowns are mostly made from alloys that do not react to a magnetic field. The most common metal-ceramic coating, but they are not a contraindication to MRI. And yet, it is necessary to warn about the presence of any metal compounds in the body: this also applies to dental crowns. Cases painful sensations in head MRI to patients with metal crowns is not recorded, but theoretically, the presence of several of these tooth coverings can significantly distort the image. About the safety of the procedure decides the doctor. In some cases, for example, the patient may be required to remove crowns. If this is not possible, MRI can replace CT scan.